Ocean Park Resort - Dog Friendly! 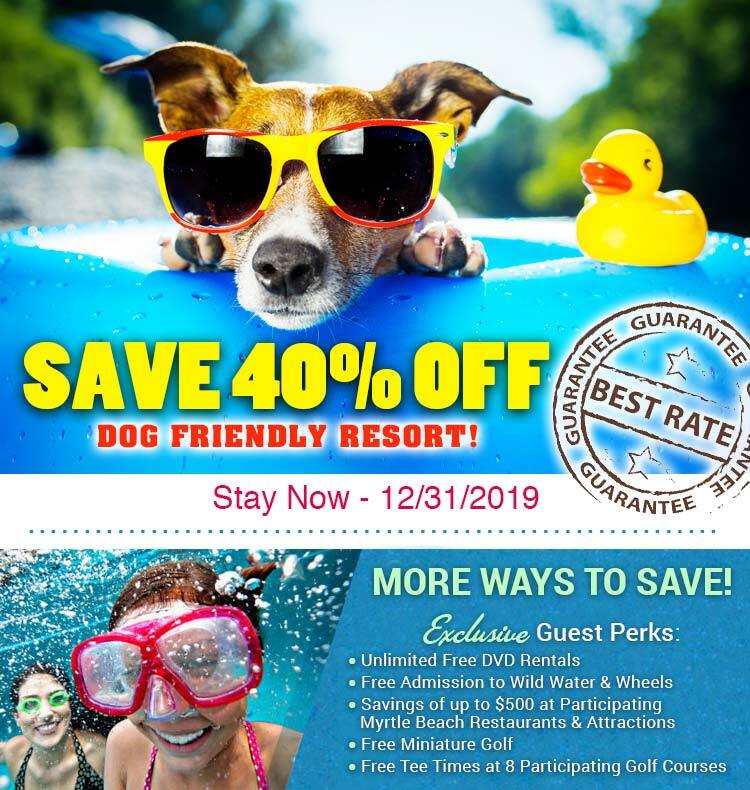 Save 20% OFF: Dog Friendly Resort! Bringing your furry friends along on your next Myrtle Beach vacation? Check out the pet-friendly Ocean Park Resort in south Myrtle Beach. Dogs are treated like kings and queens at the onsite doggy daycare and puppy play zone. Pamper them with grooming services offered right at Ocean Park. Of course there’s still plenty of fun for the other members of your family at the indoor and outdoor pools, kiddie pools, hot tubs and fitness center. The oceanfront sundeck on the second floor is a great place to lounge around while taking in the amazing ocean views. Ocean Park is home to a variety of rooms, efficiencies and one-, two-, three- and four bedroom suites that come equipped with full-service kitchens, private balconies and free wifi. All rooms at the property are dog-friendly. Ready to dive into some fun? Check out Family Kingdom just steps away or venture further north toward the Myrtle Beach Boardwalk. The Market Common is just a short drive away and offers visitors unique shopping, dining and entertainment options. Pack your bags and bring your pooch to the beach - book your room at Ocean Park Resort today! Over the past 31 years of our marriage we have spent time almost all of those years in Myrtle Beach. Many have been spent trailer camping in the summer but we also love coming in the winter. We have stayed at countless high rise hotels over these years and while each had their unique qualities our experience at Ocean Park Resort was near perfect. First off we loved the parking arrangements to be able to park so close to the entrance. In the cooler months that makes a difference.We loved our room, the towels, the pools, the staff, the prices. All was good. We are strongly considering a month long rental in 2020! We frequent Myrtle Beach several times a year and have tried many different hotels and resorts. We recently got a puppy and were happy to see she was welcome to stay here as well! The hotel was clean and has good accommodations, but there are not enough words to describe just how happy we were with the staff! From check in at front desk, bill the maintenance guy the housekeeping staff everyone was friendly, helpful and welcoming! If you are traveling with your fur baby be sure to check out the spa/shop specifically for them! They offer grooming and sitting services and wonderful homemade treats for your puppy! Awesome. Room was nice , clean and comfortable. Ocean View was perfect.Our dogs where welcomed and they do not price gouge you. The hotel was very clean and staff was very welcoming. Would recommend to all dog parents. Great staff. Very helpful. And great place to stay year round. Enjoyed the view. Nice to be in a non smoking building! Lots of small dogs. Friendly people. One of the most dog friendly places I've ever been, your four-legged family members will definitely feel welcome. Wonderful and friendly front desk, super great management. (Herb and Jarek)..they work very hard to make Ocean Park a wonderful place to visit. Highly recommend to all guests. I never take time to write reviews but I honestly needed to say something about this place. As a dog owner it’s so hard to find a nice place that is dog friendly. This place met our expectations and then some. Most places that are pet friendly are a dump. This place was great the rooms were nice and the front desk staff was amazing. Tiffanie ( I think that was her name) was super nice and very accommodating. We will stay again. The ocean front room was nice and clean. Our stay was terrific! The staff, including maintenance, housekeeping, and security were accommodating, friendly, and helpful. Ariana at the desk was truly delightful, funny, and welcoming. She went out of her way to be helpful and remained positive, even with a full lobby and line on Christmas Day. The rooms are what you should expect for a 50ish dollar per night, pet friendly condo. We had two ocean front 1 bedroom suites and found them to be adequate for 5 people in each. It was a bit tight at times when cooking but we knew it would be. The beds were comfortable and clean and the pillows a bit stiff and heavy. Plenty of blankets, sheets, and towels were available immediately upon request and doggie waste bags were conveniently provided. The pot and pan selection was not awesome but again, for the price, perfectly fine. The shower pressure was terrific, especially given the fact the place was nearly sold out. The water stayed hot for all five of us. The view was spectacular and the location incredibly convenient to everything we wanted to see and do. The indoor pool and spa were clean and comfortable. The bathrooms near the pool area were shockingly pristine and dry at all times of the day and night. I say shockingly because this is rare at any hotel I've stayed in. The outdoor hot tub is fantastic! It is spacious and provides a great way to unwind at night. The pet areas were clean and easy to access. Close Proximity to So Much! My husband and I stayed here recently (11/17-11/19) and had a great experience. We booked through Hotel Tonight and found the front desk associate, Mitchell, to be incredibly kind and accommodating. The room was clean and spacious, the view was great, and the indoor pool and hot tub were also great. Even more awesome were the free DVD rentals and the proximity to so MUCH - shopping, dining, activities. We had no problems at all. The most phenomenal resort that you can take your dog with you and you can even have them groomed and dog sitting is also available! Our beds and pillows are so extremely comfortable that you don't want to get out of the bed. Free DVD rental too! The location is in a very good location. It's close to a lot of restaurants and about a 5 minute drive to some shops. The rooms are great plenty of room to move around. The only bad thing I have to say is the wifi isn't all that great. But the staff is very friendly 😁. I would definitely recommend this place! Ocean Park was great to stay with great prices. The room was awesome. We loved having a kitchen so we could cut costs on our meals and not eat out all the time. Everyone that worked there was very friendly. Having direct access to the beach was a major bonus for my family along with having 2 hot tubs, an indoor pool and an outdoor pool. The balcony could use some work due to the stuff on the floor of it tracks in but otherwise a great place to stay. Check in was quick, room was ready early. Staff was friendly, asked for an updated room and was accommodated. Room was in front of the elevator but that was no problem. I was leery of the Pet Friendly atmosphere that also was no problem. We enjoyed our stay! A nice place to stay. Four Adults in a room with two Queens and kitchenette we had plenty of room. We just left Ocean Park Resort and we had a great time! The room we stayed in was very spacious and the way it was layed out worked very well for our family. We had a double room with the kitchen and bathroom next to it and then a living room and a balcony. There were televisions in both the living room and the bedroom. We had a roomy closet with a safe. The pools were very nice and we were right on the beach. We even saw a large group of dolphins swimming and jumping while we were sitting on the balcony one day! We had free passes for the water park and also to play mini golf. The hotel in very close to many restaurants and attractions. We would definitely stay here again! Staff was very friendly, helpful and respectful. Rooms were clean, cool and comfortable. Housekeeping came daily and made sure that we had clean towels etc. My family and I enjoyed the added perks; which included free DVD rentals, free golf games and free tickets to the water park. This was not our first time staying and it definitely won't be our last. Areyonna at the front desk is the best!!!! The place is great and the staff is the best. The rooms are nice and clean and would recommend people to try this place out you won't be disappointed. Also is pet friendly and the outdoor pool is the cleanest you could find. We enjoyed our 4 day stay at Ocean Park with our 8 month old puppy. We opted out of housekeeping and went with the snack bag option which was great. The housekeeping ladies that were on our floor did not hesitate to hand us new towels and trash bags. Our room was clean and very nice upon our arrival. It was great to have the family away from their phones. We will definitely be staying here again! We loved this place. Upon our arrival they gave us a discount card for area businesses, and a dog treat bag with milk bones and a doggy waste bags. The room was clean and quiet, it had an kitchen with oven, stove, microwave, coffee pot, and a full size refrigerator. It also was oceanfront with a balcony. The water pressure in the shower was amazing! For the dogs, they have an Astroturf and mulch area in the first floor garage for the dogs to do their business. There is also a DVD kiosk in the lobby for free rentals with your room key! The hotel / resort is definitely worth returning to when we go back to the beach!